Definition at line 52 of file llgl.h. Definition at line 271 of file llgl.cpp. References FALSE, mATIOffsetVerticalLines, mDriverVersionMajor, mDriverVersionMinor, mDriverVersionRelease, mGLMaxIndexRange, mGLMaxVertexRange, mGLVersion, mHasAnisotropic, mHasARBEnvCombine, mHasCompressedTextures, mHasCubeMap, mHasFragmentShader, mHasMipMapGeneration, mHasMultitexture, mHasPointParameters, mHasShaderObjects, mHasVertexShader, mInited, mIsATI, mIsDisabled, mIsGF2or4MX, mIsGF3, mIsGFFX, mIsIntel, mIsNVIDIA, mNumTextureUnits, and mVRAM. Definition at line 462 of file llgl.cpp. Definition at line 480 of file llgl.cpp. Definition at line 503 of file llgl.cpp. References FALSE, glBindBufferARB, glBindProgramARB, glBufferSubDataARB, glColorTableEXT, glDrawRangeElements, glEnableVertexAttribArrayARB, glGenBuffersARB, glGenProgramsARB, glGetIntegerv, glGetProgramEnvParameterfvARB, glGetProgramLocalParameterfvARB, glGetProgramStringARB, glProgramEnvParameter4dvARB, glProgramEnvParameter4fvARB, glProgramLocalParameter4dvARB, glProgramLocalParameter4fvARB, glVertexAttribPointerARB, llendl, llinfos, llwarns, mGLMaxIndexRange, mGLMaxVertexRange, mHasAnisotropic, mHasARBEnvCombine, mHasCompressedTextures, mHasCubeMap, mHasFragmentShader, mHasFramebufferObject, mHasMipMapGeneration, mHasMultitexture, mHasOcclusionQuery, mHasPalettedTextures, mHasPointParameters, mHasSeparateSpecularColor, mHasShaderObjects, mHasVertexBufferObject, mHasVertexShader, mInited, mIsATI, mIsIntel, and TRUE. Definition at line 350 of file llgl.cpp. References FALSE, glGetIntegerv, initExtensions(), initGLStates(), llendl, llerrs, llmin(), llwarns, mATIOffsetVerticalLines, MAX_GL_TEXTURE_UNITS, mDriverVersionMajor, mDriverVersionMinor, mDriverVersionRelease, mDriverVersionVendorString, mGLRenderer, mGLVendor, mGLVendorShort, mGLVersion, mHasMultitexture, mInited, mIsATI, mIsGF2or4MX, mIsGF3, mIsGFFX, mIsIntel, mIsNVIDIA, mNumTextureUnits, parse_gl_version(), LLStringBase< char >::toUpper(), and TRUE. Definition at line 1292 of file llgl.cpp. Definition at line 318 of file llgl.cpp. References FALSE, llendl, llwarns, and mHasPBuffer. Definition at line 489 of file llgl.cpp. References FALSE, mInited, and stop_glerror. Definition at line 96 of file llgl.h. Referenced by gl_line_2d(), gl_rect_2d(), initGL(), and LLGLManager(). Definition at line 112 of file llgl.h. 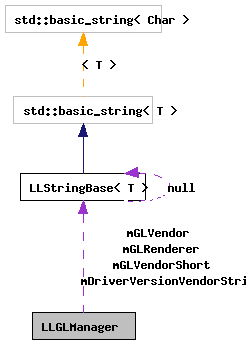 Referenced by initGL(), and LLGLManager(). Definition at line 113 of file llgl.h. Definition at line 114 of file llgl.h. Definition at line 116 of file llgl.h. Referenced by LLFloaterReporter::gatherReport(), initGL(), and send_stats(). Definition at line 120 of file llgl.h. Referenced by LLParticlePartition::getGeometry(), initExtensions(), llDrawRangeElements(), LLGLManager(), LLFace::pushVertices(), and LLVolumeGeometryManager::registerFace(). Definition at line 119 of file llgl.h. Definition at line 131 of file llgl.h. Referenced by LLFloaterReporter::gatherReport(), and initGL(). Definition at line 127 of file llgl.h. Definition at line 128 of file llgl.h. Referenced by initGL(), and send_stats(). Definition at line 115 of file llgl.h. Referenced by initGL(), LLFeatureManager::initGraphicsFeatureMasks(), and LLGLManager(). Definition at line 85 of file llgl.h. Referenced by initExtensions(), LLGLManager(), and LLImageGL::setMipFilterNearest(). Definition at line 86 of file llgl.h. Referenced by initExtensions(), LLGLManager(), and LLDrawPoolTerrain::render(). Definition at line 72 of file llgl.h. Referenced by initExtensions(), and LLGLManager(). Definition at line 87 of file llgl.h. Referenced by LLCubeMap::bind(), LLCubeMap::disable(), LLCubeMap::enable(), LLVOSky::initCubeMap(), initExtensions(), LLCubeMap::initGL(), LLGLManager(), LLDrawPoolWater::prerender(), LLPanelDisplay3::refreshEnabledState(), LLVOSky::restoreGL(), and LLShaderMgr::setShaders(). Definition at line 80 of file llgl.h. Referenced by LLPipeline::canUseVertexShaders(), initExtensions(), LLFeatureManager::initGraphicsFeatureMasks(), and LLGLManager(). Definition at line 73 of file llgl.h. Referenced by initExtensions(), LLPipeline::renderGeom(), and LLShaderMgr::setShaders(). Definition at line 70 of file llgl.h. Referenced by LLImageGL::createGLTexture(), initExtensions(), and LLGLManager(). Definition at line 68 of file llgl.h. Referenced by initExtensions(), initGL(), LLGLManager(), main(), LLDrawPoolWater::render(), LLDrawPoolTerrain::render(), and LLDrawPoolWater::renderShaderSimple(). Definition at line 81 of file llgl.h. Referenced by display(), LLUseOcclusionListener::handleEvent(), init_debug_rendering_menu(), and initExtensions(). Definition at line 71 of file llgl.h. Referenced by initExtensions(), LLTexLayerParamAlpha::render(), and set_palette(). Definition at line 77 of file llgl.h. Definition at line 82 of file llgl.h. Definition at line 110 of file llgl.h. Definition at line 78 of file llgl.h. Definition at line 76 of file llgl.h. Referenced by initExtensions(), LLViewerWindow::LLViewerWindow(), and LLPanelDisplay2::refreshEnabledState(). Definition at line 79 of file llgl.h. Definition at line 64 of file llgl.h. Referenced by assert_glerror(), LLImageGL::createGLTexture(), initExtensions(), initGL(), LLCubeMap::initGL(), LLGLManager(), and shutdownGL(). Definition at line 90 of file llgl.h. Referenced by initExtensions(), initGL(), LLFeatureManager::initGraphicsFeatureMasks(), and LLGLManager(). Definition at line 65 of file llgl.h. Referenced by LLImageGL::bindTextureInternal(), LLImageGL::cleanup(), LLImageGL::createGLTexture(), LLViewerParcelOverlay::idleUpdate(), LLCubeMap::init(), LLGLManager(), LLViewerWindow::restoreGL(), LLViewerWindow::stopGL(), LLDynamicTexture::updateAllInstances(), LLViewerImageList::updateImagesCreateTextures(), LLViewerImageList::updateImagesMediaStreams(), LLVOSky::updateSky(), and LLVOAvatar::updateTextures(). Definition at line 93 of file llgl.h. Referenced by LLImageGL::createGLTexture(), initGL(), LLFeatureManager::initGraphicsFeatureMasks(), and LLGLManager(). Definition at line 94 of file llgl.h. Definition at line 95 of file llgl.h. Definition at line 92 of file llgl.h. Definition at line 91 of file llgl.h. Definition at line 69 of file llgl.h. Referenced by LLImageGL::destroyGL(), LLImageGL::destroyGLTexture(), initGL(), LLGLManager(), and LLDrawPoolTerrain::render(). Definition at line 118 of file llgl.h. Referenced by LLViewerImageList::getMaxVideoRamSetting(), LLGLManager(), and main().